“It’s about using the power of the words,” says the director Jeremy Herrin. He is reflecting on the Royal Shakespeare Company’s stage adaptations of Wolf Hall and Bring Up the Bodies, the meaty Hilary Mantel novels that have achieved the double feat of topping bestseller lists and winning literary prizes. At more than 1,000 pages combined, the books pose a formidable challenge to adapters. Discussing the adaptations, Herrin repeatedly mentions the importance of “moving forwards”, stressing the dynamism of his approach. Mantel’s novels, which trace the turbulent politics of Henry VIII’s reign through the behind-the-scenes figure of Thomas Cromwell, are dense with court politics. The stage versions navigate this by hopping rapidly from location to location with minimal fuss. 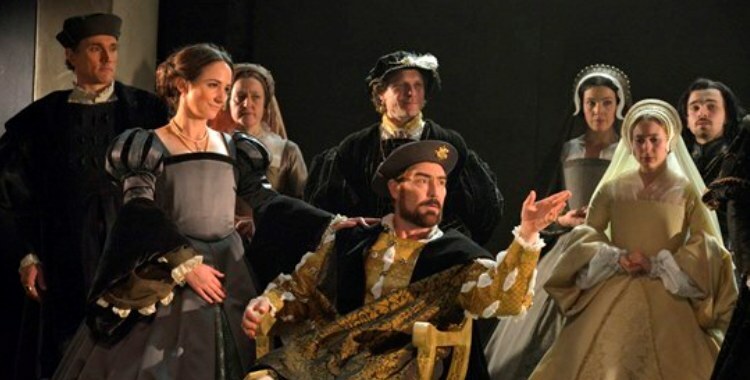 In telling this fictionalised historical narrative, Herrin was keen to avoid some of the more familiar tropes that have congealed around representations of Tudor England, devising, instead, a stage language that “could hint subtly at modernity”. After a successful initial run, the move from Stratford-upon-Avon to London’s West End, where the double bill opens next month, presents another challenge for Herrin. Of the change of stage, he says: “We’ll have to find the right performance language to fit in that room.” It’s “a chance to have another go at it and tell the same story under different circumstances”. At the same time as preparing for the London transfer, Herrin has been settling into his new job as artistic director of touring theatre company Headlong. For the man once dubbed “Britain’s busiest director”, the added workload should not be a problem, but filling predecessor Rupert Goold‘s shoes is no mean feat. Herrin shrugs off the pressure, simply saying, “I’m really grateful to Rupert for doing his job so brilliantly”. Herrin is now in the midst of his first season in charge, with an updated version of Frank Wedekind’s Spring Awakening out on tour and a new co-production with the Royal Court coming up this summer. For Herrin, the priority is to “keep doing what we do really well” and – as with all his work – to continue making the theatre that inspires him.